Combine the oats, milk, orange rind, orange juice, water, almond meal, cinnamon and sesame seeds in bowl. Cover and refrigerate overnight or for approximately 6 to 8 hours. 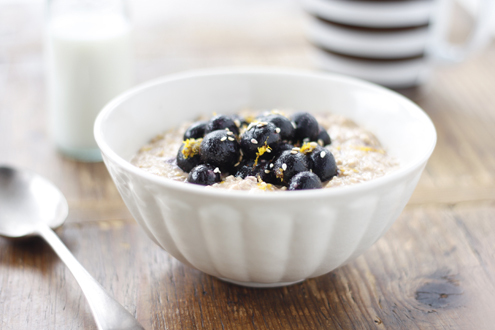 Serve topped with blueberries or alternatively you can gently fold them through the muesli. Post-GDM serving suggestion: Serve with rounds of sliced orange on top. Pardon this American, but should this be soupy? Mine came out very watery. Thanks for the advice. Hi Lisa, If you make this for one, can you store the mixed dry ingredients for use the next day or should you make the whole recipe and just divide it in half, keeping the other half in the fridge for the next day? Not sure about the “keepability” of orange rind in dry ingredients….